For a long time, the town has been Quang Yen political center of a large area from Mong Cai to Bach Dang River.Dated on 24th Ausgust, 1945 the revolutionary government in Quang Yen was established. On 2nd July, 1964 the Government Council decided to change the town of Quang Yenbecome district capital of Yen Hung District to this day. In the past years, Quang Yen town grew commensurate with the potential urban spatial development, socio-economic and cultural changes. The town development orientation played an important role to the process of industrialization, modernization and socio-economic development, ensuring national security,ecological environment protection and creating environmental sustainable living. With the position of geographical advantages, the land stock, environment, tourism, major construction works of the country has been formed, the fund's wealth and resources. Quang Yen Town contains the potential for rapid and sustainable development which can link economic space with the city to form a dynamic economic axis of coastal Hai Phong – Yen Hung – Ha Long. 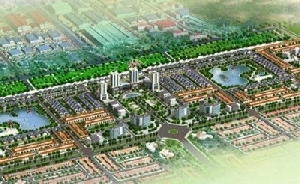 During the period of industrialization, modernization and reform implementation, with the attention and support of the Central government and the provincial authorities and the Party Communist and the people of Quang Yen Town, they were developing internal resources, the labor, the creativity to build and develop the town.Until now, the town of Quang Yen had the fast urban development, economic growth, high structural shift in the right direction, construction of infrastructure investment increasing urban and development. The town currently has a lot of projects implemented in the province. Especially in recent years, the government invested in priority infrastructure and social infrastructure which favorable impact on the development of Quang Yen in the coming years. Quang Yen has promoted the functional role of the core urban of Quang Ninh, results in many aspects of socio-economic, construction and upgrading of urban infrastructure, attractinvestment in industrial development, services expansion.Works focused on improving education quality, maintain universal primary education, universal secondary education.Disease prevention, health care ensured the social security, administrative reform, environmental protection, social security. This achievement is a prerequisite and foundation reflecting the realities of urban development.